The Feed My Sheep charity in Dominica, houses many people, many of whom are children. The Salty Dawg Association ( a sailing organization to which I belong) did an event at Feed My Sheep. I wasn’t there, but two others read my books to the kids. 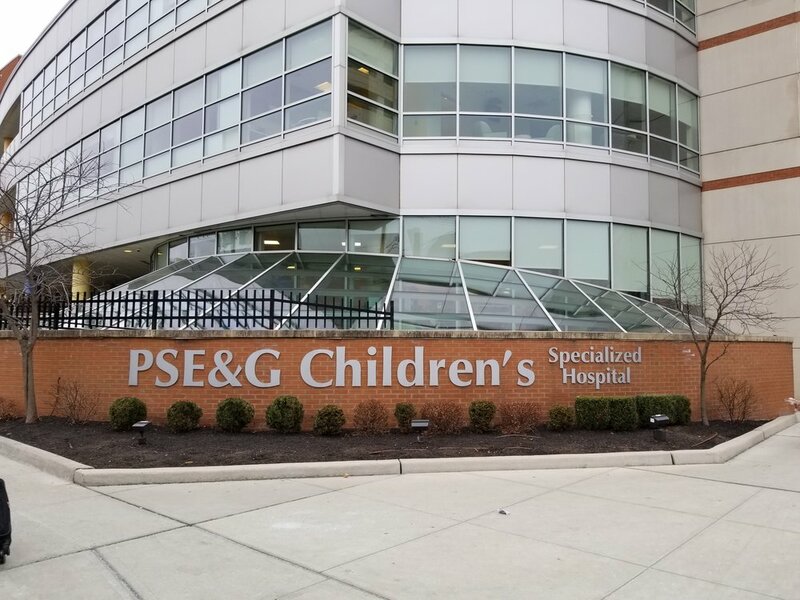 Click on this link to hear the Chessie Tale Reading. Click on this link to hear the Of Monsters and Fire Reading. In October, I read Little Leona and a Chessie Tale to second graders in Maui. We did it all on Skype. Because they couldn’t see the book on the screen, the teacher held the book up and kept pace with my reading. Afterwards, they had many questions, which I answered the best I could. Then they took a vote on what book I should write next. They overwhelmingly agreed that I should write one about the danger of strangers, which happens to be the third book in the series! The following is a short video of my reading to them. Enjoy! Reading Little Leona to second graders. Ronald McDonald and Little Leona! 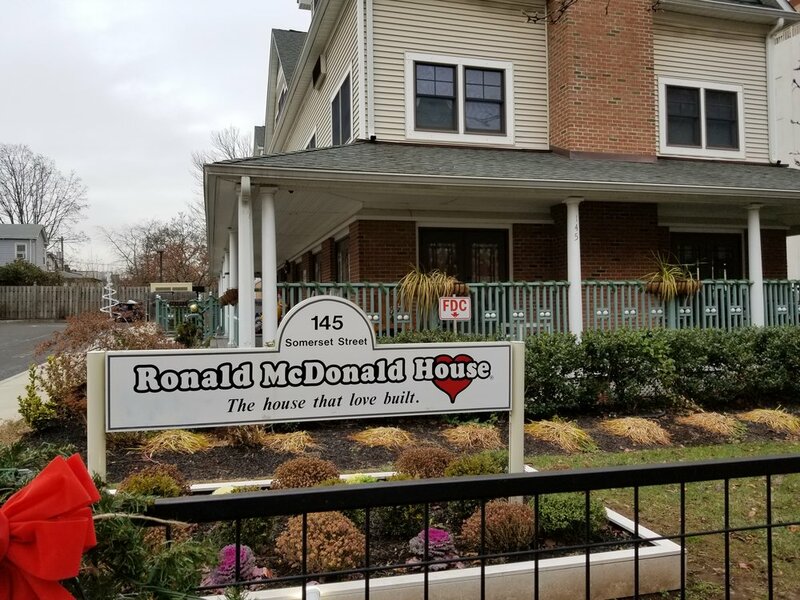 Susan Collin is the executive director for Ronald McDonald House of Central and Northern New Jersey. Below she is posing with my Little Leona books which were donated to her. She loved the books and will purchase a second set so the two Ronald McDonald Houses in Long Branch and New Brunswick each have copies. Currently the fire department (Local 68) has just completed a renovation at the house at Long Branch. Ms. Collin reported back to me that they will also stock the books at the firehouse. Finally, Ms. Collin is heading to Las Vegas for a national conference, and will take the two Little Leona books with her to show them around to her peers. This was all a Christmas present from my brother. He had worked with Ms. Collin and put the books in her hands. Thanks James. It was a wonderful gift. Wow. I gave Ahh Coffee seven copies of my two books and they've sold them all. So I went back and gave them another armful. Thank you Ahh Coffee! I also went to the Eastport library and donated two copies of Little Leona and a Chessie Tale. They already have several copies of Little Leona of Monsters and Fire. 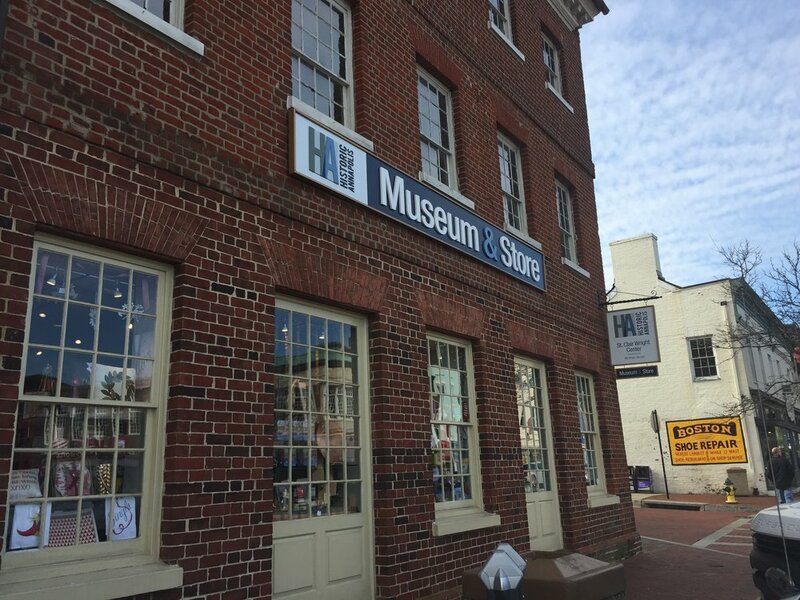 Finally, the Museum Store in downtown Annapolis has my books prominently displayed in the children's section. With Midnight Madness tonight in Annapolis, hopefully I'll see more sales. Thank you to everyone who liked my posts, shared my blogs and a special thank you to those who bought and/or reviewed a book. PS Just added an author page to Goodreads. Check it out. I Guess Good Things Come In Threes! Ahh Coffee is now selling my books! I went in today and they said they've sold two already. Wonderful people there, my books aside. Above is Amanda who cheerfully makes my chai. Thank you to all the staff who have so generously supported me. Barnes and Noble now carrying my book! Since it was published, Little Leona of Monsters and Fire has been online at Barnes and Noble, but it was hard to convince them to put it in their store. But perseverance paid off and now you can find it in the Annapolis store, right by the door! 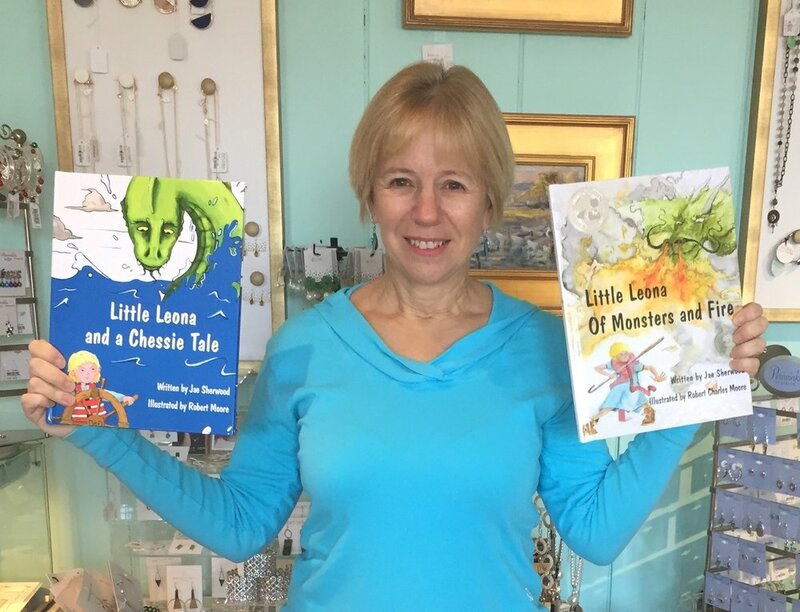 The Historic Annapolis Museum Store on Main Street is now selling both Little Leona of Monsters and Fire and Little Leona and a Chessie Tale. If you're looking for a holiday gift for someone young, this might be that special gift. They also have many other gifts for both children and adults. Come by and check them out. Available on Amazon. This book is about boating safety. Chessie is a metaphor for a storm. When Leona loses someone overboard, she and her crew know just what to do to save him. Sorry the picture isn't very good. Just wanted to get something up in a hurry. Check out my interview on Vocal Expressions. Click here to read the interview. I know, it's a boring title for a post. But it's really very exciting. The local libraries have three copies of my book, Little Leona of Monsters and Fire, and they are all checked out with one on hold! That's so gratifying to see. Without any push from me, children and/or their parents are independently wanting my book. So a few days ago, I donated two more copies. Can't let those children be disappointed! Thank you Shirley, at the Broadneck Library, for letting me read Little Leona on Saturday. The kids liked my book, but I think they liked the firetruck even more! Tomorrow, April 1st at 10 am, I'll be reading Little Leona of Monsters and Fire to elementary school kids. Haven't done a reading in a while. I'll have to practice projecting my voice! If you know any kids ages 5-10 who might be interested, bring them in for the fun. My next book in the Little Leona series should be out by late spring. Above is a rough draft of the cover. Chessie is a metaphor for a storm. Leona loses one of her crew overboard in the rough water, but following all the safety rules and procedures, they rescue their friend and all return safely to shore. I'm currently looking for endorsements. If you know anyone at an organization which deals with boating safety, please pass the name onto me and I will followup. Thanks in advance! A friend of mine sent me this photo of a listing of events at the Annapolis Libraries. They are already advertising my reading set for April 1. Again the fire department will be there. So happy to be spreading the fire safety message! This morning, on the Baltimore CBS station WJZ 13, I was featured on the show On Time with Marcus Washington. In my segment, we discussed how my book is a good vehicle to discuss fire safety with children. Thanks, Pam, for helping me pick out a top which would look good on TV! Click to link with interview. Little Leona of Monsters and Fire is now available in paperback. This brings the price down to $14.95. The hardback version sells for $18.95. It's still the same size with the same amazing pictures. It can be purchased on Amazon, Barnes & Noble online and of course, through my publisher, Maple Creek Media. Just wanted to express my appreciation to my publicist, Cherrie Woods, of Eclectic PR (www.eclecticpr.com). She is a joy to work with, very dependable and gets the job done. She told me she would try to get me on TV, and she did, twice! She helped me design glossy postcards for book fairs and book signings. She's the whole package. Thank you Cherrie.